"The flavors of truffle oil, parsley, and Parmesan cheese combine to create a whimsical gourmet appetizer or snack." Mix the truffle oil, parsley, and Parmesan cheese in a heat-safe bowl. Place unopened package of popcorn into center of microwave oven; cook on High power until the bag fills with popped corn and the pops occur about 2 seconds apart (1 1/2 to 4 minutes, depending on oven's power). Open hot bag carefully and pour into bowl. Toss with truffle oil mixture; season to taste with sea salt. 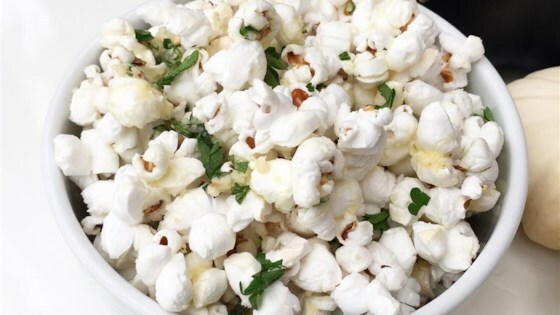 Try this cheesy, Italian-inspired homemade popcorn for your movie night in. Popcorn can be topped with shaved truffles for an extra special touch. You can make your own microwave popcorn with just popcorn, vegetable oil, and a brown paper bag with this simple recipe. OMG! We call this "crack corn"...its addicting! Mine came out a bit salty, but still tasty. Will make again with less salt. The truffle oil/parmesan/parsley mixture clumped together and certainly would not coat the popcorn in any kind of reasonable way.